We all have fears and sometimes it takes the encouragement and support of someone to help us overcome them. 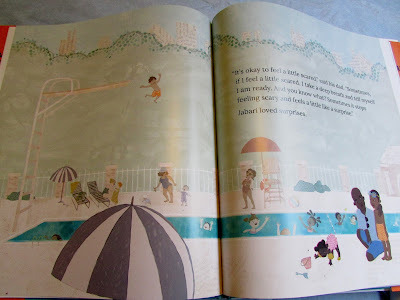 The hardcover book of Jabari Jumps shows a boy who wants to jump off the diving board, but has both excitement and fear. He doesn't outright express his fear but rather talks to himself to rationalize doing other things instead. During this experience, Jabari's father is encouraging. He doesn't belittle his child but, instead, is patient and supportive. This book shows the emotions of overcoming a fear and the connection of a child with a loving father. 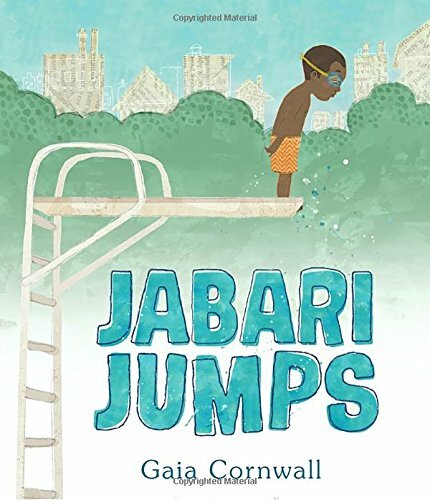 One person will win a hardcover book copy of Jabari Jumps. I am afraid of enclosed places. I cannot stand not being able to move away.... like in a MRI tube.... not going there again. I'm afraid of riding on motorcycles. GMO's and food dye scare me. I am not comfortable on fast and twisty roller coasters. I'm AFRAID OF SPIDERS, ROACHES(ESPECIALLY THOSE FLYING ONES) AND SNAKES. I am afraid of some dogs and other animals. I'm afraid of falling, injuring myself and not being able to get up. I am afraid of bee stings! Ouch, those hurt! I am afraid of the dark. We have a motion censored night light in our room, the closet doors have to be closed and the blinds have to closed. Something about looking out into the darkness makes me think something is or will be looking back at me. I really am afraid of flying. I haven't it let it stop me if there was no other alternative, but it's pretty tense for me. I am afraid of getting injured- breaking a bone or bruise. Ouch! I am afraid of the ocean! It is such an unknown place with so many dangers. Definitely no cruises for me! Afraid of losing my loved ones. I'm afraid of roosters and frogs. I don't really enjoy theme park rides. I don't mind heights if I'm stable. If it's moving, no thanks. I am extremely afraid of snakes. There is only one thing I am afraid of in this world; something happening to any of my kids. I'm afraid of crocodiles and alligators. This book reminds me of one I used to have as a child. If you give a mouse a cookie I think was the title. I am afraid of fire and heights. I don't mind flying in a plane but I wouldn't want to jump out of one. i have a fear of elevators. i got stuck in one one time and now i take the stairs whenever possible. I am afraid of snakes. 6 fooot black snake was sunning himself on our front stairs. I scream. I've recently become afraid of flying, especially over water. I have a phobia about mowing grass. I am VERY afraid of dinosaurs. I am afraid of people in trench coats. Winter is hard. I'm afraid of ceiling fans. I'm afraid of driving! I can do it, but I hate it! I'm afraid of something happening to my family. I'm sure you can relate.